A few months ago, we were lucky enough to meet the award-winning Choreographer and Director, Drew McOnie, on the set of The Wild Party with our Social Ambassadors. It was the first, but hopefully not the last, time we’ve interviewed someone on a bed. For the video shoot, we were down in the studio at The Other Palace to interview the cast of the show with Ambassadors Bella Hamilton and Lola Adaja. 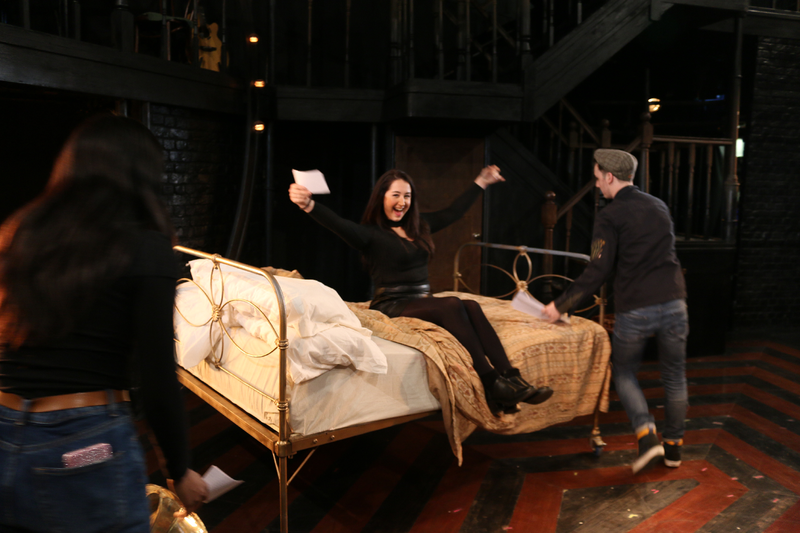 After wrapping the cast section, we stepped into the main house to meet Drew on the stage. He greeted us with a big smile and even gave us a hand moving props around for photos and setting up for the video. Drew jumped onto the bed that features in the show and sat atop the frame while Bella and Lola sat together on the mattress. As he spoke, we could see his energy on and off camera is exactly the same; he’s warm, open and friendly. After the interview was over, Bella and Lola were taking pictures of the set and having fun when Drew asked, “Do you want to get in the bath?” They nodded vigorously and he laughed as he pulled over the bathtub, a prominent prop in the show, and they jumped in to take a few silly selfies. Looking back on that day, it’s incredible to think how busy Drew must actually have been and how generous he was with his time, because it seems that hardly a month goes by that doesn’t see a new Drew McOnie show being announced. In honour of Drew’s brand new production of On The Town, opening at the Open Air Theatre in Regent’s Park, we’re taking a look at how Drew got to where he is and what young performers might learn from his journey. On The Town sees Drew reunited with The Wild Party‘s Lizzy Connolly and brings Hollyoaks star Danny Mac back to his theatre roots. The story follows three sailors as they run around New York for a day searching for the perfect girl. It’s a high-energy show featuring the music of Leonard Bernstein that was made famous by the Gene Kelly and Frank Sinatra movie of the same name. It would be so easy to be envious of his Drew’s level of success, especially given his young age, but it’s important to remember the hard work, determination and positivity it takes to get to there. Industry insiders are also unanimous: he’s a pleasure to work with and genuinely nice guy who wants to create the best piece of work he can. Along with talent and dedication to your craft, being nice goes a long way in building up a professional reputation. For most dancers, the love of it begins at a young age and Drew is no exception. Growing up in Birmingham, he began dancing at six and soon proved to his parents that his love of performing wasn’t a passing fad. After taking classes and earning a scholarship, Drew joined the cast of Cats in Germany at the age of 17 for a year-long stint, after which he joined Sir Matthew Bourne‘s production of Edward Scissorhands. Matthew went on to cast Drew in a number of other shows, then he moved on to roles in Chicago and A Chorus Line. In 2009, Drew earned himself a spot on the show So You Think You Can Dance. His hard work and talent gave him the chance to showcase himself week after week to a TV audience. Here he is with dance partner Charlie. One of the biggest challenges that many dancers face in the industry is trying to be seen by the right people. Drew clearly made a big impression when he appeared on So You Think You Can Dance but it takes determination, a collaborative nature and desire to learn and grow that can help anyone succeed. While he was working on Jekyll And Hyde, he discussed auditions and the importance of classes in an interview with London Theatre. “We have such extraordinary dancers in this country, yet its so hard for so many of them to get seen. That’s why with Jekyll and Hyde we did such big open auditions because it’s so hard for many of them to get seen by casting directors. Fast forward a few years and Drew has set up his own dance company like he always dreamed and has been Olivier Award nomination for Jesus Christ Superstar, which returns this year. 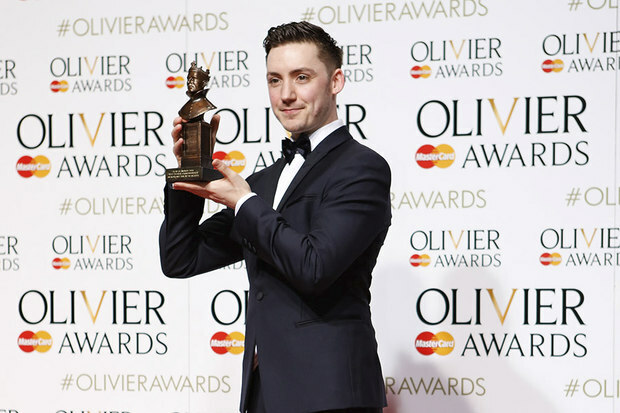 He has also just directed Strictly Ballroom back in December, but many of his younger fans will be more familiar with his work on Lin-Manuel Miranda‘s In The Heights, for which Drew won an Olivier Award in 2016. Still in his early thirties, he has fast become one of London’s hottest rising stars, creating not only an impressive body of work which have earned him industry accolades, but he shows no sign of stopping. 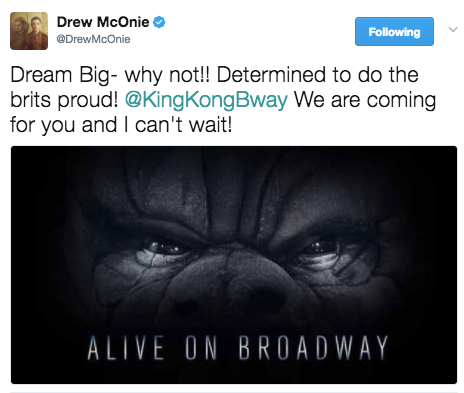 It has just been announced that Drew will choreograph and direct King Kong on Broadway. Written by Jack Thorne (Harry Potter and the Cursed Child), the show will follow the classic story of a filmmaker, his leading lady and a giant gorilla. Drew McOnie has gone from strength to strength, with bigger projects on the horizon. You can get tickets to see his latest show On The Town right now playing, don’t miss it! Want more? 7 Reasons why we love Annie the Musical.